Ultra running in the UK is coming on in leaps and bounds. It’s gone from being the ultimate niche sport, only known to a few and participated in by even fewer, to the charity fundraising event of choice for celebrities. In 2009, for Sport Relief, Eddie Izzard ran 1000 miles in seven weeks, off a base of five weeks’ training. In 2010, James Cracknell ran the infamous Marathon Des Sables, a six-day 156-mile race across the Sahara desert (and finished 12th – the highest placing ever for a Brit in the race). In 2011, David Walliams swam 140 miles of The Thames (again, for Sport Relief). And so the world of endurance events beyond the marathon has gradually permeated the public consciousness. In most running clubs you’ll find a runner who has run an ultra or two. A bit over a year ago, having run the Paris Marathon (my first 26.2-miler), I was at a club training session with the memory of burning quads, cramping calves and searing blisters still fresh in my mind. The Abingdon Amblers attract a wide range of abilities, but Paul Fernandez was one of the club’s best-known elite runners. He had a local reputation for versatility, performing equally well in 10k smack-downs and 24-hour endurance races. Paul had recently been selected to represent England at the 50km distance. ‘The problem with marathons’ I overheard him say once ‘is they’re a bit too fast.’ The idea of just easing off the pace (and by which, he would have meant easing off the pace to a consistent mile split still considerably faster than the equivalent of my marathon PB) a little to squeeze out an extra few miles seemed almost inconceivable. So, what is the attraction of ultra running? Anyone running a marathon for the first time will tell you about the pain of the 20th mile and the sheer willpower that goes into just… keeping… moving. Despite this, millions of people worldwide (in fact, 2009 was the first year that more than half a million people in the USA completed marathons over the course of the year) run marathons. Running 26.2 miles is a physical and mental test, and completing a marathon is a significant achievement. But surely that’s achievement enough? 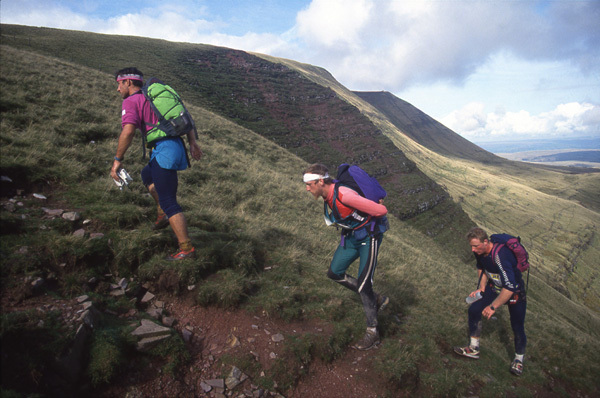 What makes someone want to run 50 or 100 miles in one epic slog? In June 2011, Tom Williams and Martin Yelling from the Marathon Talk podcast ran Comrades Marathon, a world-famous 56-mile endurance race in South Africa. The direction of the race alternates on a yearly basis, resulting in ‘up years’ and ‘down years’ (and in case you were wondering, yes, it’s hilly); finishers are awarded different medals based on their finishing time, and at 12 hours the course is closed. Get to the finish line a second behind the 12-hour mark and it’s a harsh DNF for you. My father’s South African and through first him, and then my interest in endurance sport, Comrades seemed like the natural thing to do. As the marathon becomes more and more popular I think people are constantly looking for something to stand themselves out from the crowd, and also to challenge themselves in a different way. I guess you can try and go faster or longer? Of course, as more and more people show what’s possible with a little focus and dedication then more and more feel capable of taking on those challenges. It’s a mental as well as a physical test. You have to be mentally strong enough to push past the tough times. Definitely… an open mind to what the human body is capable of. The top ultra runners are currently achieving things that not so long ago most of us would have thought impossible, and from talking to them it’s clear they believe there is plenty more to come. And if you want an example, Josh Cox is a US-based ultra-distance runner. A couple of years ago, he had a crack at winning Comrades, only to be thwarted by his digestive system (proof that it happens to the best of us). If you have a few minutes to spare, the video below is about the most inspirational running video I have ever seen. With 19,591 entrants to the 2011 race, Comrades is a big event and carries the same kind of history and prestiege as the Virgin London Marathon. This is in stark contrast to the majority of ultra-distance races in the UK, where the field of competitors is rarely more than a couple of hundred runners (the largest ultra in the UK has a capacity of around 850), and often significantly fewer. I spoke to a couple of race directors to get their take on the rise in ultra running and the challenges facing race organisers. Personally, I like long mountain adventures, difficult terrain and races that take you on a journey both physically and mentally. 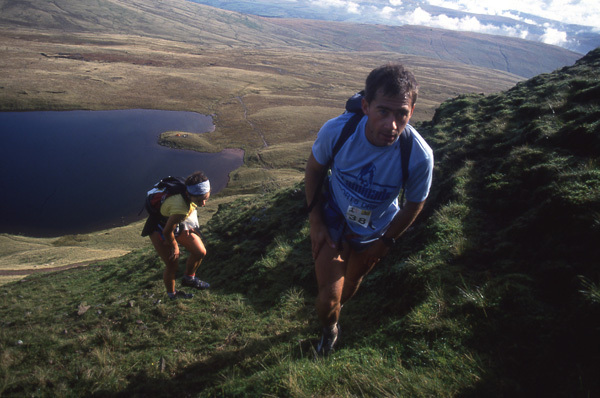 The original Dragon’s Back Race held in 1992 seemed like one enormous adventure and an incredible challenge, and once I starting thinking about resurrecting the race my enthusiasm just grew and grew. I’ve just spent 10 days in Wales thoroughly recce’ing most sections of the race and I am completely reassured that the race will fulfil all mine and the competitors’ wildest expectations. The Dragon’s Back Race is already sold out (there were 100 places originally) but additional places become available as competitors become injured, ill or just lose motivation. Also, I am planning to increase the overall number of competitors in the New Year after I have finalised some arrangements with the major stakeholders that I am liaising with. If someone’s entry is accepted now, they are added to a waiting list. My plan is for the Dragon’s Back Race to be held annually or biannually, but I waiting to see how what the final workload is like before committing. I am also organising the Great Lakeland 3Day in May 2012 (www.GreatLakeland3Day.com), which is a more grass routes and low-key three-day mountain race. In fact it’s ideal preparation for the Dragon’s Back Race and many of these competitors are also doing the Great Lakeland 3Day as part of their preporation. Also, I am working on two other ultra-running concept events at the moment. Whether these see the light of day or not is yet to be seen. Shane touches on an interesting point: the ultra-running community in the UK is still comparatively small, so runners are signing up for both of his events. Although ultra running is becoming more and more popular, at its heart there is a small, tight-knit, hard-core of regular ultra runners. Over the course of miles, hours, days strong bonds can be formed amongst the runners. As anyone who has organised a race will tell you, volunteers are critical to an event’s success. With marshals at the head and tail of the race field, refreshment (and at ultra distance, feed) stations strategically placed throughout the course, first aid support, timing and logistics, ultra distance races take a lot of organisation and support. Some races see a ratio of almost 1:1 runners to volunteers, although others manage the challenges by requiring runners to provide their own support crew. Add to this the need to gain permission from multiple land owners over a course of at least 30 miles and the job of a race director can be immense. Despite all this, the price of entry to ultra races remains resolutely low. Big city marathons and half-marathons typically cost around £40 or £50 to enter; lower profile races tend to set runners back between £10 and £20. It’s not unusual to find an ultra race that’s around the £40 mark (giving you considerably more miles for your pound than races with larger fields), and if you don’t mind an early start the Winter Tanners 30-mile run is just £5 (including tea and cake). If you want an example of the passion that underpins the ultra-running community, you need look no further than the generosity of the race organisers. Since ultra runners are often drawn to destination races – Comrades, UTMB, Marathon des Sables, etc. – and all the associated travelling costs, race directors could conceivably increase their fees without affecting the number of race entries. How do you train for an ultra? Many runners will be familiar with the trials and tribulations of marathon training. Weekend after weekend taken up with three-hour or more runs, hitting the roads after work for a sly 15 miles in the cold dark winter months. So, how on earth do you go about training to run twice marathon distance? Don’t overdo the training! Although that sounds like a rather lazy approach, when training for Comrades I did a large number of long runs (22, 24, 26, Yorkshire Three Peaks Marathon, 28, 30, and 36 miles) and looking back feel like my training tired me out too much. At the same time I coached two athletes for their first Comrades, both had spring marathons as ‘A’ goals and both raced in South African off pretty much standard marathon training schedules… both achieved silver medals. With new ultra races arriving on the scene to fill the gap for endurance races in the UK, more runners may be in better condition to go really, really long than they think. It may be a long time before there is a UK equivalent of Comrades (and since many ultra runners are escaping the swelling marathon hordes, there’s certainly a question about whether there’s support for any ultra getting so big), but behind the tight-knit community of ultra runners lies a super-dedicated group of race organisers who need your support. So next time you’re eying up flights to Boston, New York or Berlin and looking for a destination marathon, spare a thought for a home-grown ultra. A smaller field and a bigger challenge, perhaps, but certainly something you’ll always remember. Special thanks go to Tom Williams and Shane Ohly, amongst others, who kindly gave their time to help with the research for this post. Please share and comment, especially if you’d like to see more of this sort of article on Foot4ward.